SWEENEY FIELD is the official game and practice facility of the Women’s Lacrosse team. Located in the center of campus, Sweeney Field has undergone numerous changes over the years. 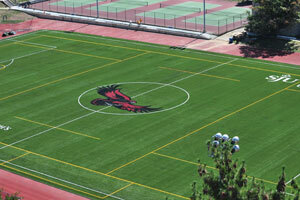 Recently, the AstroTurf surface has been replaced with state-of-the-art TigerTurf . The expansion of stadium seating, a brand new press box, and a new surround sound system has truly created a home field advantage on Hawk Hill. The recently renovated Women’s Lacrosse Team has new wooden Lockers with plenty of storage for their lacrosse apparel and equipment. This new locker room has a fully equipped entertainment system with a 65” flat screen. The Varsity Weight Room and Full time Strength Staff provides the Women’s Lacrosse Team with the opportunity to work on their strength training, speed and agility development.